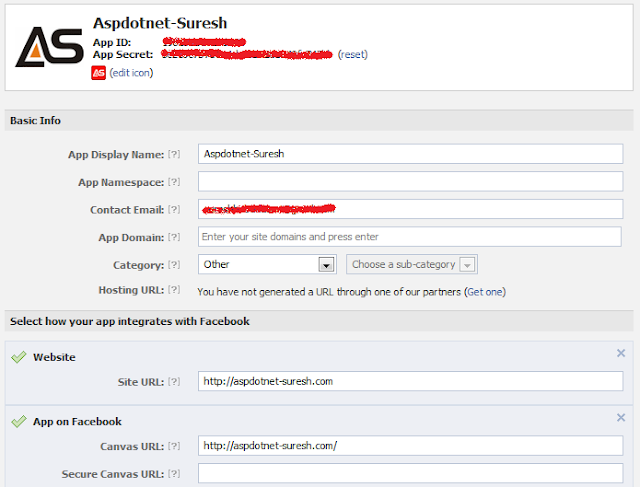 Here I will explain how to add facebook login website in asp.net or integrate facebook login button to website in asp.net and how to create application in facebook. In previous post I explained many articles relating to Asp.net, JQuery, and SQLServer etc. Now I will explain how to allow users to login with facebook accounts in website using asp.net. Once our app created on facebook that will be like as shown above image now we can change logo of our app and icon of our application. 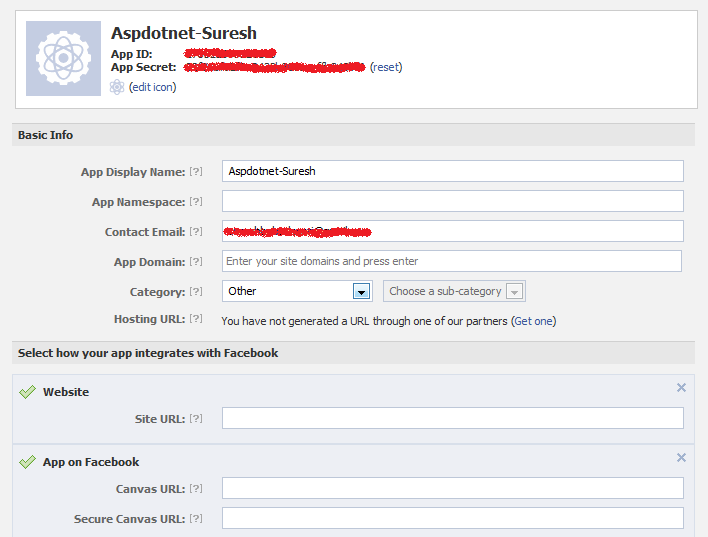 After that we need to add Site URL, Canvas URL that would be the url of your site (Ex: http://aspdotnet-suresh.com) which site you are going to integrated login button. Actually facebook has stopped support for localhost sites (ex: http://localhost/Default.aspx) because of that we need to give hosted domain site url. FB.init: This function is used to set authentication statuses. FB.api: This function is used to get authenticated user details. In above code you need to make small modification that is need to give your appId in FB.init function (appId: ‘YOUR APP ID’). U Alwayzz Rockzz Man Wid U'r new Tutorials..
Really Nice Efoorts By U Dude. Can you develop and give me a simple facebook app using .net and integrate with that with facebook fanpage.My page is getting reloading many times. i am unable put this code ..
that is in body section..below script. will u please help me it's very urgent . and which URL i put in connect to facebook button ? How to get this user name in asp.net pageload. Logout button and user details are not showing. How to get this user name and email in asp.net pageload. Hi Suresh, Is it possible to use this method in Masterpage? means my website is still not launch ...so without it can i do this? how to redirect to user homepage after login ?? how set if user loged show page else redirect on home? can u plz tell me how to do without using FBML using C# ?? how can i get my application to redirect to another page upon a successful login? please provide sample code in attachment,that get user information from fb..
hello suresh, i tried your code and login works fine but i can't see logout option. How to post wall without open dialog? In My application,there is Login page for user. So, How to open that by using same Facebook Loging. Now if I want to update or write status from my website then how we will do this? but the problem i am facing is that only i am being able to login and and fetch user details. for other users its shows the error. user details are not showing. Suresh you are a hero. God bless you. Hi Sir, This article is very nice. Can you please post an article for integration of gmail authentication to a website, to check the login using gmail username & password. Thank You. I'm Darshan i want develop app like status of facebook and if any one post text or image other can comment on thet post how can i do plz tell me sir.. Please let me know what could be the issue. I am using application hosted on my IIS with custom URL. what we configure can you tell me. One or more of the given URLs is not allowed by the App's settings. I am using Local Host, I have not hosted the application. Hi Sir, This article is very nice. But I want to change facebook login button. So how to change facebook login button with my custom image. nice article. But i need to display a confirmation dialog box where it asks "...will receive the following info: your public profile, friend list and email address." how to do it? Really amazing work that is working exactly....! Thankss buddy..it helps me so much..
Hi suresh,how to set schedule for facebook to post the wall? It is not working with other facebook accounts, its working for only the account from which app has been created. thanks..! it works well but i want user info such as personal information ,education etc. Please guide me how to get it . Hey bro,can you tell me why this message "Please use your Personal Account" like this type of message coming after submitting the captcha?? ?I can't create the app.Pls tell me.This is my own account .Though its coming.Pls help me bro. I got a case id while reporting my problem.But still I didnt get any feedback 4m them.Pls bro how to solve this problem. thanks a lot... it worked... just wanted to know the code that facebook developers link is providing, is it the same as that one? First time when i implemented this , my site was running fine. How to get a Comment and like of post which post above way? Thank you for your article! It's very helpful for me. Hi, I just need little help and guidance in the subject. I have worked on 3 tier website reservation management system using ASP.NET C# and used AJAX too. I know html and can understand and edit css.and I know how to create web service and use it. In short comfortable working using Dot Net and said technology. But presently i'm trying to see and develop a "blog kind of web application" (where admin post question and user can write answer as blog/comment) and that can be integrate in Facebook but developed using c#. I have found article using php and yahoo query but i have not work on these and also i want full control on back end like sql server. Because it will be easier and will work with client website as it was created in asp.net. Please help me with this i need to find out and start working at earliest. This facebook login is not support IE bowser other bowsers in working fine..it not showing facebook login button also. if i try to login with other facebook userid .it dont work.throws error. "App Not Setup: This app is still in development mode, and you don't have access to it. Switch to a registered test user or ask an app admin for permissions"
how can we allow all users to authenticate ? Hello, I wonder as assigned to the user facebook, in user de membership. will you give me css of above code? "Login with Facebook" this is not clickable..